The Downbeats were formed in 1962. The original members were Simon Kennard (lead guitar), Ges Nicholls (drums), Geoff Killick (bass guitar), and Paul Wakeham (rhythm guitar). Ges Nicholls and Geoff Killick had previously played in a band called The Ramblers. Like many groups at the time they had no singer and played instrumentals, influenced by groups like The Shadows and Tornados. They played at local youth clubs & halls in and around their home town of Solihull. However, all that would shortly change. In April 1962, whilst still at school, they met Simon Kennard and Paul Wakeham and formed The Downbeats. The Downbeats continued playing local venues. In December 1962, the group were looking for a singer and were approached by Christine Hodgson, who lived in Knowle, and who, “wanted to sing with a group”. Christine joined the group as vocalist in January 1963. The Downbeats were one of a very few bands to have a female singer and this enabled them to widen their repertoire to include covers by Dionne Warwick, Dusty Springfield, The Supremes, etc. 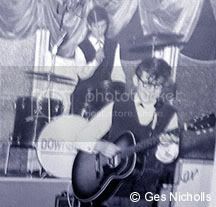 In February 1963, The Downbeats came second to The Fortunes, in a “Battle of the Bands” contest, at Edgbastons’ Tower Ballroom. In October of 1963, Christine left to pursue a solo career and sang for a short period with The Applejacks under the name Christine Holmes. Her career took off when she won the part of Charlie Girl in the West End production of the same name. It ran for five years at the Adelphi Theatre London. She also wrote the song Devil Woman for Cliff Richard and hosted the popular children’s TV programme “Crackerjack”. Jon Carter joined The Downbeats as lead vocalist in October 1963. Shortly after Jon’s arrival, the group played at The Royal Oak, Hockley Heath. Following this booking they were offered a residency which was to last almost two years, with The Downbeats playing there every Wednesday, Saturday and Sunday during that period. The Downbeats were regulars at the Solihull Civic Hall on Monday nights and were “on the bill” the night that the Civic Hall was “put under siege”, following the Applejacks release of their hit record Tell Me When. On a normal Monday night, the venue regularly attracted up to 1,000 teenagers, but on that particular night it was estimated more than 3,000 had tried to gain admission! The Downbeats were now in demand to such a degree that Paul Wakeham decided to leave and he was replaced by Ricky North, who joined the group playing keyboards and guitar. 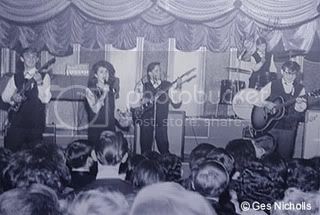 In October 1964, a female vocalist was added to the group when Mary Harris joined, and within weeks they were involved in another band contest, this time winning the final at the Locarno, Birmingham. In January 1965 Ricky North left the group and was replaced on keyboards by Graham Sibley. Graham had previously been a member of a Birmingham group called The Freeways. The Downbeats continued to be very busy, playing at venues across the Midlands and in between supporting well known bands such as The Barron Knights and The Rockin’ Berries. In May of 1965, The Downbeats were invited to play at The Variety Club of Great Britain Star Gala. This event was held at London’s Battersea Park Festival Gardens and sponsored by The News of The World, and the group performed in front of 10,000 people. The Downbeats disbanded in October 1965.